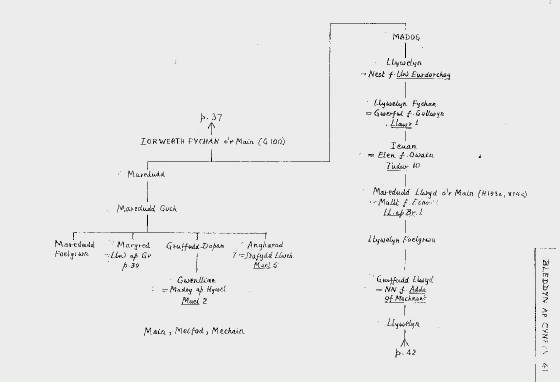 Since this family predates the Second Powys Dynasty of Bleddyn ap Cynfyn (which began in 1063) and since the lands in Mechain were among the holdings of the First Powys Dynasty (descended from Cadell Ddyrnllwg and Brochwel Ysgithrog), we believe this is a branch of the earlier Royal Family. Chronologically, the Maredudd of Main fits as a brother of Aeddan III and Beli II, sons of Selyf II ap Brochwel II. In the mid-13th century when coats of arms were first assigned to the early Welsh patriarchs, the family seated at Main was thought to have descended from Iorwerth Goch ap Maredudd ap Bleddyn ap Cynfyn and was assigned the "Black Lion of Powys". But apparently its living representative, Llewelyn Foelgrwn, could count generations and knew his ancestor preceeded Bleddyn ap Cynfyn. He thus rejected those arms, choosing for himself "argent a lion passant sable within an indented border gules". This suggests he either did not know the ancestry of his Iorwerth Goch, or that he would accept a black lion so long as it was not the lion rampant of Bleddyn. "this brother, Iorwerth son of Maredudd, was extremely agitated and distressed at seeing the honor and power that Madog enjoyed, while he himself had nothing. He sought out his comrades and foster-brothers for advice, and they decided that some of them should go to Madog and ask for maintenance for Iorwerth. Madog offered to make his brother head of his troops, with equal rank, honors, arms and horses..." The passage continues, saying Iorwerth rejected the offer and went off to raid England. We would suggest that Iorwerth accepted the offer to become Madog's penteulu and it was a wholly different Iorwerth who went to England (Iorwerth Goch #3 below). Iorwerth Goch ap Maredudd first appears in the Brut in 1157 as the man who burned down the castle in Ial which Owain Gwynedd had built in 1149. The Gwynedd king had forcefully extended his territory east of the Clwyd (into Powys) and in 1157, King Henry II brought his army to the forest of Hawarden in Ystrad Alun where he met and defeated elements of Owain Gwynedd's army, and proceeded to Rhuddlan on the Clwyd River. Owain declined to meet the king's army head-on but retreated across the Clwyd to Tal Llwyn Pynna near Abergele, Rhos. Meanwhile Madog ap Maredudd observed both armies from a point "between the king and Owain", taking no part in the hostilities. It is not clear from the Brut account which side Madog was prepared to take, but we suggest he was hoping the English would accomplish what he himself had been unable to do: drive Owain Gwynedd from Powys. A truce was struck between Owain and King Henry after the former agreed to withdraw from lands east of the Clwyd and to restore certain lands he has seized from his brother Cadwallon. It was after Owain returned to Gwynedd and Henry went back to England that Iorwerth Goch destroyed the Ial castle. We suspect it was there that Madog's army had waited out the battle, and that Madog ordered it razed since it had been a symbol of Gwynedd presence in Powys. Some historians suggest that Iorwerth Goch was acting for King Henry, but it was a different Iorwerth Goch who was an ally of Henry. In 1165, Iorwerth Goch ap Maredudd ap Bleddyn ap Cynfyn joined Welsh armies of Gwynedd, Powys, Deheubarth and Fferlys to oppose an invasion by King Henry II which culminated in the battle of Corwen. Heavy wind and rains bogged down the English army and it withdrew in frustration. Again, historians claimed Iorwerth Goch had acted with England in 1157 but switched sides in 1165, and back again in 1166. We believe they continue to confuse two different same-named men. It would appear that after the death of Madog ap Maredudd in 1160, his younger brother Iorwerth Goch took possession of Mawddwy and Mochnant. The Brut reports he was driven from Mochnant in 1166 and the descendants of his son Madog Goch are found in Mawddwy in the 14th century. Descendants of his other son, Iorwerth Fychan, probably also resided in Mawddwy, but that branch became extinct in the 13th century. We date the birth of this man c. 1135 and think he was also "ap Maredudd ap Bleddyn" but not Bleddyn ap Cynfyn. He is the man found wholly in Salop and allied with Henry II. The only marriage cited for any of the 3 men of this name is with a daughter of Roger (or Richard) de Manley of Cheshire, and we would assign it to our third Iorwerth Goch. We think it was this marriage which brought him the manor of Cae Hywel in the parish of Kinnersley in Salop. In 1157, he was granted the manor of Sutton in Alnothstree Hundred in Salop, apparently for his services as "latimer" or interpretor to King Henry. He was also given possession of Chirk Castle by the king in 1166. Two medieval manuscripts mention an Iorwerth Goch ap Maredudd ap Bleddyn as a man "of Cae Hywel and Creuddyn", while his son Gruffudd is cited as "Lord of Sutton" and "y Marchog Gwyllt of Cae Hywel". This was the "Sir Gruffudd, the wild knight" cited as an ancestor to the Kynaston family, and who died in 1221. (b) Eldest son who received the manor of Sutton, but died childless in 1194. He is often confused with Madog Goch of c. 1145, son of the Powys Iorwerth Goch. (c) The Wild Knight who received Cae Hywel, but became Lord of Sutton after the death of his older brother. He died in 1221 leaving 3 sons including Gruffudd Fychan, whose son Gruffudd was the first to adopt the Kynaston surname. Although Cadwgan ap Bleddyn of this family loyally served Owain Gwynedd and received the lands of Nannau in Ardudwy, his nephew Iorwerth Goch had learned to speak French and as a young man about 22 years old, joined up with King Henry II about the same time as the older Iorwerth Goch of Powys burnt the Gwynedd castle in Ial. He grew to maturity in England acting as the Welsh translator for the king and was introduced to the daughter of an English knight when he sought a wife. He remained in England where his heirs acquired other lands including Kinnerly and Kynaston. His son and grandsons all married English ladies. While there is no reasonable excuse for thinking the c. 1010 Iorwerth Goch of Main, Meifod was identical to the 12th century men of that name, it is not difficult to understand why careless historians confuse the later men. Both were "ap Maredudd ap Bleddyn" and both appear in written records dated 1157 and 1166. But one was born and died a man of Powys, while the other was born in Gwynedd and lived in Salop, England in the employ of King Henry II. Without burdening this paper with our detailed analysis of the family descended from the "English" Iorwerth Goch, it is very doubtful he was yet born when Maredudd ap Bleddyn ap Cynfyn died in 1132. One other matter bearing upon the Salop lands of Sutton (later called Sutton Maddock after a son of Sir Gruffudd ap Iorwerth Goch) should be mentioned. One writer suggests this Iorwerth Goch obtained Sutton via a marriage to Hamo Peverel, reasoning that since Sutton was held by Gerald de Tornai in 1086 and a daughter of that Gerald had married Hamo Peveral, that perhaps it was a daughter of Hamo that brought the manor to Iorwerth Goch. But this Hamo had to be a man born in the mid-11th century who daughter would have been at least 50 years old when Iorwerth Goch was born. It is chronologically possible that he married a daughter of a later Hamo Peverel (Hamo son of Payne son of William, which William was a brother of the earlier Hamo), but this would not have brought Sutton to him since (a) the later Hamo wasn't descended from the earlier Hamo, and (b) all the holdings of Gerald de Tornai were forfeited to the king in 1088. It was escheat lands which Henry II gave to Iorwerth Goch. F.A. Gooch "The History of a Surname", 1926, pp 19 & 38. This writer also refers to Iorwerth ap Bleddyn ap Cynfyn (a man born c. 1055) as "Iorwerth Goch" but there is no source supporting that contention; he appears often in the Brut as simply "Iorwerth"